Bowling Green, Ky. - June 8, 2010 — How many times have you wanted to spend a fun, family oriented day out but thought, “I don’t want to travel several hours to have a great time?” Well, guess what? Beech Bend Park and Splash Lagoon has your solution and is practically in your own backyard! Beech Bend offers something for everyone in your family. They will marvel at the amusement park, water park, miniature golf course, racetrack, and campground. You won’t know which attraction to begin your day, or perhaps, your weekend of fun. Once you go, you will wonder what took you so long to discover what Beech Bend has to offer. If it has been a while since you have visited Beech Bend, or if you have never experienced the facility, you are in for quite a treat. After millions of dollars in renovations and new attractions such as their state-of-the-art roller coaster Kentucky Rumbler, Beech Bend Park and Splash Lagoon is Kentucky’s ultimate family playground! In the amusement park, parents will have trouble containing their toddlers who will attempt to drag them to spectacular rides such as the Bumble Bee Bop, Happy Pond, and Mighty Mac. Middle school-aged children will run circles around parents eagerly awaiting their turn to ride attractions such as The Flying Bob, Shock Drop, and Spider Ride. The entire family will marvel at the four roller coasters: Kentucky Rumbler, Wild Mouse, Looping Star and Dragon Coaster, all of which make Beech Bend the paramount amusement park in this region and beyond. 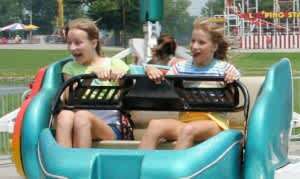 Beech Bend’s newest and most impressive roller coaster, Kentucky Rumbler, offered itself to roller coaster enthusiasts for the first time in 2006. It has received worldwide attention and was featured on a Discovery Channel documentary in April of 2006 entitled Building the Biggest. “The program features several wooden roller coasters, but the main focus is the Kentucky Rumbler,” Liz Collier, assistant producer of the documentary said. She went on to say that it is the most beautiful wooden roller coaster right now. “From an engineering point of view, it’s an atypical story in terms of using modern technology to create a classic look,” she added. Beech Bend Park and Splash Lagoon Offers World-Class Fun and Excitement for the Entire Family. Splash Lagoon, Beech Bend’s premier water park features Raging Rapids, Lotta Wata Island, and a giant leisure pool with plenty of room to soak up the warmth of the sun, cool off, and have good, old-fashioned family fun. The Raging Rapids water slides consist of one open family tube ride; one partially open and partially enclosed tube ride; and one completely enclosed body slide. All three slides boast a length of greater than 400 feet, start from a 45-foot tower, and have too many thrilling turns to count. Lotta Wata Island features a four-level interactive play structure and two water slides. Toddlers especially will enjoy this low water-level play area. For racing enthusiasts, Beech Bend offers a world-class racetrack that hosts several national events including the National Mustang Racers Association World Finals, Lucas Oil Series, Buick GS Nationals, Tenn-Tuck Bracket Bash, and several Corvette events. The raceway is open from March through November and offers stock car racing on the Oval Track on most Friday nights, “fun” drag racing on Tuesdays and Saturdays, and NHRA drag racing on Sundays. Fans have a great view to cheer on their favorite racer from the large bleacher area. 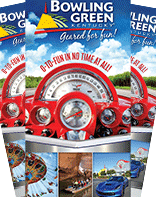 Perhaps your goal is to plan an extended or over-night trip to Bowling Green. If so, Beech Bend campground offers over 500 sites in a beautiful wooded setting where both RV and tent camping are permitted. To relax after all the other exciting attractions of Beech Bend, visitors have the opportunity to sit and roast marshmallows by the campfire. Peaceful Barren River is within walking distance where anglers can catch a few fish, take in the scenery, and enjoy the sounds of nature. Beech Bend has something for everyone. Whether you want the thrill of a coaster, need a cool down from the hot weather, love auto racing, or just want to enjoy nature your every need will be met. Beech Bend Park opens in April, and Splash Lagoon opens in May. For more information, please visit http://www.beechbend.com or call 270-781-7634.